Farmers and growers on small farms in coastal northern California have shown interest in exploring diversification of crops ... and a few have attempted growing a few mandarin citrus varieties. Deborah Giraud, Farm Advisor for Humboldt County UCCE, and Tracy Kahn, UCR Specialist, began a trial to assess a more "cold hardy" clone... and to test several cold-hardy mandarin varieties in the North Coast region. 96 trees of cold hardy Satsuma mandarin varieties were first propagated and grafted at the Lindcove Research & Extension Center, and then transferred to the Hopland Research & Extension Center for planting in March of 2013. All of the trees grew well until the cold and dry freeze (down to 18 degrees F for several nights) decimated all of the trees down to the Trifoliate rootstock. Unfortunately this low humidity cold event brought the project to a quick termination. 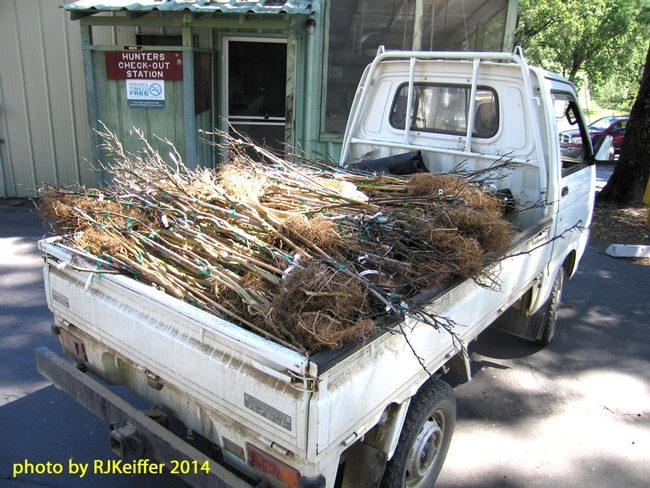 The young trees were removed in April of 2014, as you see piled on the back of the HREC vehicle.